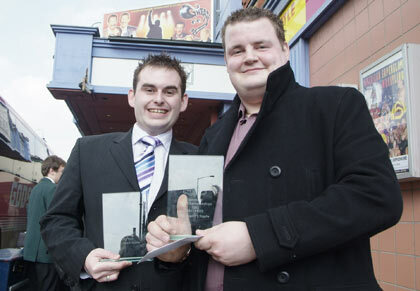 The Tameside Open has become a fascinating contest in recent years. It is one of the first opportunities the bands have had to put their instruments to their lips post the regionals and the contest can be seen as a chance to blow the cobwebs away, disprove the adjudicator's comments or continue to maintain the good form of recent weeks. Another interesting ingredient is the fact that some of the bands are graded differently for a local contest such as this one, as opposed to the Regionals where they get a National grading. Hence, in the case of the Championship Section here, all four bands had recently performed �The Wayfarer'. Richard Evans (the judge for the Championship Section) would have quickly picked up on this fact, and although some allowances may have been made he would have also heard whether or not these were �true' championship standard performances too. Richard Evans highlighted the point in his summarisation after the Championship and Second Sections that conductors need to think more about their choices of pieces and its suitability for the players. The maestro even admitted the winners in the Championship Section (Timperley) were a touch lucky on the day � some good playing, but the suitability of the test piece for the players gave him enough to ponder on. Even the winners have some considerable way to go before they could really think about making a mark at the higher level. Both Richard and Steve Pritchard-Jones gave honest assessments of what they'd heard during the day - commending the playing but commenting on things that they'd no doubt mentioned over the previous regional weekends. In addition to his comments on MDs looking at the choice of pieces selected, Richard Evans referred to bands finding difficulties with the lyrical qualities of �The Wayfarer' in particular. He made a point of congratulating the MDs who directed well from the middle � an aspect reflected in his decisions on the day. In judging the Third and Fourth Sections, Steve Pritchard-Jones talked about the basics once again: Listening to one another, playing together, watching the conductor � all positive stuff that was mentioned to help bands in a constructive, not critical way. Only four bands turned out in the Championship Section, which was a little disappointing considering three, pulled out. The contest continues to attract the bands although it could easily accommodate more than the 23 here on the day � the prize fund of �5200 from Tameside MBC is fantastic and with the winners of each section taking �600. More bands should consider it a very viable and financially rewarding option. There are always reasons (some good, some not so) with withdrawals and whilst they'll all have had their reasons one of the most significant concerned Eatons Farnsworth. They had to withdraw because their soprano player, Roger Ford fell off the roof in a work related accident and unfortunately has suffered spinal injuries. Needless to say everyone wishes him well on his recovery. Once again Frank Hodges, Derek Atkinson and their team of helpers ran the contest efficiently, and the standards they set in running an event such as this should never be overlooked. Just four bands battled it out in the top section � all four had competed in the First Section at the Areas so it wasn't a huge surprise that three of them opted for Eric Ball's �Sinfonietta � The Wayfarer' once again. 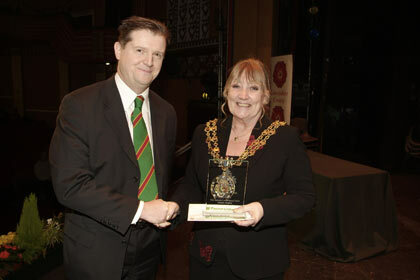 The winners, Timperley became the exception with David Evans' band opting for �Cloudcatcher Fells'. This certainly challenged the band and it did take a few moments to settle, but when it did there was some quality playing to be heard. David Evans injected plenty of energy throughout and the band did respond, demonstrating some fine playing in the �Angle Tarn' section that carried with confidence right to the end. It wasn't the most convincing winning performance that you'll hear at a contest and Richard Evans did admit the winners were a �touch lucky' - but it did enough to edge out the other three bands. Ashton-Under-Lyne and Phil Chalk had to settle for the runner-up spot with a controlled performance of �The Wayfarer' that certainly benefited from having Stuart Lingard, formerly top man at YBS in the cornet ranks. Throughout the whole performance there were plenty of warm musical sounds on offer and Phil Chalk directed the performance with real confidence and flexibility in some of the tempo markings. Mossley and Duncan Byers were delighted to have taken the final podium place at the NW area two weekend's previously, and it's a partnership that has quickly gelled together and their future looks promising. The quality of sound was warm with some impressive playing around the stand, whilst the tempos were taken as written and there wasn't an awful lot to chose between the two local rivals come the announcement of the results. Unfortunately, Tintwistle had an off day and it just didn't happen for them from the word go. The links between the three movements were ineffective and they did take too long to settle for us with a performance that had a bit of a musical hangover feel to it. Middleton took the spoils in this section and maintained the good form that will see them compete at Harrogate in September. The band opted for Goff Richards' �Oceans' for their choice here and whilst it stretched them at times, the cornets and euphoniums pulled out all of the stops on the day that really enhanced their overall performance. It's not perhaps one of Goff's finest works (the Young One's episode towards the end is a touch too cheesy) but this was a committed and enjoyable performance nonetheless. Listening to Kippax it's very easy to identify why they keep featuring in the prizes at the moment. The band opted for the Butlins set work, �Kaleidoscope' and Keith Wardle kept things very neat, tidy and effective. Nothing was over-done, no over-blowing and the direction was easy to follow. The band does the basics very well indeed and the look like they enjoy playing and competing together. A real sense of confidence is in evidence and it showed here, as they thoroughly deserved a top two place on the day. Celebration time! : Middleton Band celebrate their win! Third place went Boarshurst for a solid interpretation of �Carnival' that owed much to the sensible direction from Graham Hetherington in the middle. Graham kept things as simple as he could and it worked well. The middle movement �Pavane' was a real joy to listen too with a nice sense of flow and relaxation to it. Trinity Girls could consider themselves a touch unlucky not too has featured in the top three. Stuart Barton's band also opted for �Carnival' and they owed an awful lot to Mark Jones who was in fine form in the principal cornet seat. The ensemble was also very good too, so perhaps it came down to a preference choice of the interpretation from the man in the box. Valley Brass and David Chadwick chose Sir Dean Goffin's �My Strength, My Tower' for their offering and it somewhat stretched them � at times a touch too much perhaps. The links between the various sections weren't always as solid as they should've been, but this way a commendable effort from a band which won the Pontins Youth �B' title last September. There is plenty of potential but the downfall on the day was perhaps the choice of work performed. Greenalls were another band whose choice of work perhaps had an impact on their placing of sixth. John Luddon's band opted for Darrol Barry's �Swiss Excursion' used at Pontins last year. Once again it had moments where it really did become effective, but it just stretched them a touch too far in places on the day and that proved costly come the announcement of the results. Finally, Eagley and Gareth Westwood who chose Victor Ewald's �Symphony for Brass' that was used as a Regional work for the Second Section in 2002. It just seemed for that the band wanted to blow a little too loudly instead of letting the music speak for itself and it got a little too heavy and harsh at times � something perhaps picked up on in the box. . In this five band field, there was a great mini battle between the winners of the Third Section in both Yorkshire and Lancashire - Dodworth Colliery M W representing the White Rose and Oldham Band (Lees) from Lancashire, the Red. Both bands are getting used to battling it out against one another on the contesting stage and it is proving to be a most enjoyable and beneficial battle for both the audience and the bands themselves. Dodworth took the honours at Harrogate last year, but Oldham had revenge at Pontins, and they'll be up against one another in the Third Section Finals in September. Both are excellent bands with two talented MDs who know their stuff and work their bands very hard � and it's paying off in fine style. On this occasion, it was a very close run thing and for Steve Pritchard-Jones, it was down to �nit-picking' on the tiniest of details. In the end, Steve opted for Dodworth who gave a neatly constructed performance of Peter Graham's �Dimensions'. Yes, there were times when everything didn't go to plan - the opening wasn't a 100% - but thereafter some lovely playing could be heard with nothing being overdone in terms of dynamics. 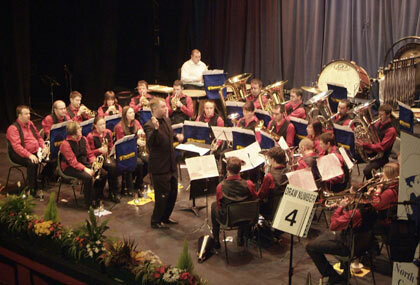 Oldham Band (Lees) performed �Prelude and Jubilate' from the number one draw. Steve Pritchard-Jones did comment once again on the quality of the performance but mentioned that tuning issues that had swayed him at the end. Whichever way this had gone, no-one could've really complained (the bands will say different) but to the listener such as ourselves it was always going to be nip-and-tuck. This was another well controlled and constructed performance of a difficult work � on another day it may have come out on top. Alan Widdop's Uppermill had to settle for 3rd place � and would have been delighted by the result and the performance too. Once again, Steve Pritchard-Jones praised the band for its interpretation of Philip Sparke's �Triptych for Brass Band', but it was the middle movement that proved to be costly on the day. The quality of performance though was excellent, very tight, musical and effective on the ear. Eccles Borough opted for �Variations on Laudate Dominum' and it was easy to hear why the band did well in Blackpool where they came 4th and narrowly missed out on Harrogate. There were some moments of uncertainty, and a few tuning issues, but this was fully committed performance where that desire to perform well shone through. The band hasn't done an awful lot of contesting of late, but they'll hopefully be happy with their recent performances and the future looks bright indeed if they can maintain this kind of form. John Roberts' Nelson Brass chose the Fourth Section set work, �The Seasons' and on this evidence, it tested them. They took a while to settle down and at times they never sounded quite comfortable with the different styles required with the work � the waltz section in particular seemed to lack confidence although the approach was spot on. There was plenty of encouragement there though and they were up against a strong old field, so much to look forward too. The overall standard in this section was mixed but the cream certainly rose to the top. James Holt and Besses Boys were jubilant at the announcement of the results after a really solid performance of �The Seasons'. The band's flugel player was a real delight throughout the performance and they made their presence felt right from the opening moments of the piece. The horn playing in the Waltz was classy on the ear and the confidence within the band continued into the final movement with a neat sense of military precision to the march. Coppull and Standish drew the dreaded number one in this pre-drawn contest and they have to be congratulated for its performance on �Facets of Glass' at 9.30am on a Sunday morning. The Pontins Fourth Section work from last year is one that can test any band at this level, but Harry Bentham's band did very well at Prestatyn finishing in a top six place and they played with plenty of conviction and confidence here too. There were moments of uncertainty but the �Finale' was taken at a cracking tempo where the band really enjoyed themselves. Blackley took third place with a performance of Peter Graham's �Dimensions' that wasn't totally as convincing as the top two placed bands but it progressed well after it had taken time to settle. There were some neat touches on display from the main soloists and the ensemble and it too was an encouraging performance of merit. Littleborough Public was another band to opt for �The Seasons' but it never really settled down for us and lacked that real consistency which was so essential. They only really seemed comfortable in the closing section, but once again there were signs of a compact and tuneful band on display. Arnfield Brass did well here last year but Drake Rimmer's �Othello' seemed to stretch them somewhat on this airing and perhaps another choice could've been more appropriate. The dated style of writing doesn't sit well nowadays and the work lacks colour � perhaps a choice that didn't come off for obvious reasons. 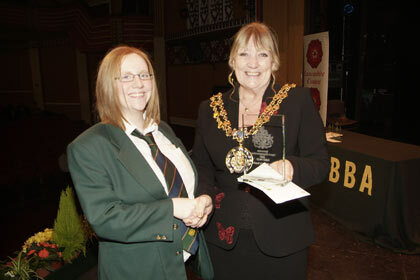 That just leaves Denton Brass and St John's Mossley. Denton Brass is a band that is working hard under RNCM student, Jonathan Davies. It was great to see them with a full compliment of players again after some difficult times and although the performance of �The Seasons' wasn't as strong as other performances in this section Jonathan's excellent work in a relatively short space of time is already evident � they can only go in the right direction. 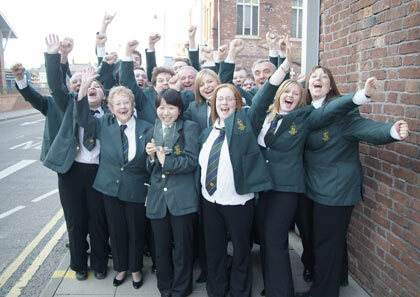 St John's Mossley and Stephen Corbett opted for Peter Yorke's �The Shipbuilders' � a real old classic when they took to the stage as the last band in this section. Andrew Reynolds was in good form in the Principal Cornet seat, but overall it did seem that this famous piece was more than a tough nut to crack on the day and the great ship was just holed below the plimsoll line a few too many times to make a real mark. The musical rivets can be out back in place though and they will have better days than this during 2007.